My design was inspired by one of Shimelle Laine's brilliant Glitter Girls videos on You Tube, where she uses PL cards to create a layout. I kind of digressed quite a bit from her design, as you do, but it was a very easy page to put together, and it means I can use more cut-aparts from the same collection to create a co-ordinating PL layout, so I will definitely be using this format again. The Simple Stories Homespun Collection Kit and the Simple Stories Daily Grind Chipboard Stickers - different collections from the same company always seem to work well together. The collection kit has lots of cut-apart sheets ideal for PL layouts, as well as patterned papers, stickers, alphas and even some transparent overlays which I haven't tried yet. I love the bright but faded tones and the weathered woodgrain and as you can see, the colours include yellow, aqua and red - perfect! The chipboard stickers have a lovely vintage feel to them and include some arrows - ideal! So, I used Explore, Arrows and Yellow for the 1 of 5 Challenge - which would you choose? 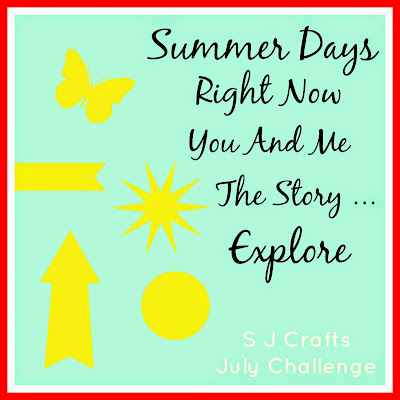 If you make a project inspired by this challenge, remember to link up over at the SJ Crafts Blog or on the FaceBook Page to show us what you created! Lovely fun page - though that's a lot of stash pulled out for one page ... just think of the tidying away!!! Lovely layout, busy yet simple all at once.